Applying for US citizenship can be a long and complicated process. Many seniors would not know how to begin the process, so Self-Help for the Elderly provides a Naturalization Program to assist them with the application process. Participants will receive information, consultations, and assistance with citizenship applications. They can participate in English as a Second Language (ESL) classes to learn the English language, citizenship classes to prepare for the application process, and civics classes to learn the rights and duties of citizens. They will learn about American history, government structure, election structure, and geographic areas. Classes are held in community center classrooms that host around 50 people. Two beginners and two advanced ESL classes are offered to reach all levels of English proficiency. Students are encouraged to improve their English in order to pass their citizenship interview. They will be educated on the process to becoming a citizen and will go through all the steps in preparation. Bi-monthly naturalization workshops are free to legal permanent residents seeking to apply for citizenship. Immigration attorneys are available to provide no-cost legal advice and counsel. 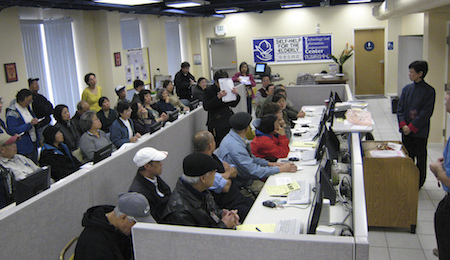 There are approximately 100,000 people in San Francisco County who are eligible to become citizens, but might not know how to navigate the system. Self-Help for the Elderly wants to help those people. Call us today to learn more about the Naturalization Program.